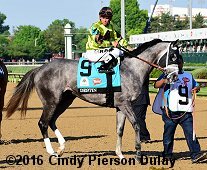 Note: Destin broke his maiden in his first start last year in October at Belmont Park then finished second in an allowance at Gulfstream Park in December. He made his 2016 debut finishing fourth in the LeComte Stakes (G3) at the Fair Grounds then shipped to Tampa Bay Downs to win the Sam F. Davis Stakes (G3) and the Tampa Bay Derby (G2). He trained up to the Kentucky Derby on a two month layoff, then finished 6th. He skipped the Preakness to wait for the Belmont Stakes. He was on the pace the entire race during the Belmont Stakes and got ran down at the finish by Creator, finishing second by a nose.